Get the smooth, velvety skin you’ve always wanted with Gold Bond Ultimate Softening Lotion, the daily moisturizing lotion that makes dry, uneven and rough skin noticeably soft and smooth. Seven essential moisturizers are combined with the skin nurturing vitamins A, C and E, plus natural shea butter and a unique Silk Peptide Matrix to soften and smooth even the driest, roughest skin. It penetrates fast, is non-greasy and has a fresh soft scent. Hypoallergenic and dermatologist tested, this formula has the power to get skin back to healthy, yet is gentle enough to use on your face. 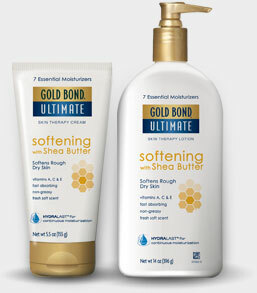 Gold Bond Ultimate Softening Lotion replenishes and maintains your skin’s natural moisture level while it makes your skin noticeably soft and smooth. You can actually see and feel the difference!